4th Annual Charity Rooftop Party a success - again! When over four hundred people gather together in a party mood it’s going to be a great evening, - and it was! From early morning the workers had transformed the rooftop of Hillside Condotel 4 into the party location for a fantastic evening of delicious food, an amazing variety of bars, live bands and fun games. Khun Wachara Tantranont, owner of Hillside Condotel & Plaza, once again kindly provided the venue, staff, general bar and sound systems. By late afternoon almost everything was in place and all that remained was to await the arrival of the first guests. Wine Gallery managed the wine bar with its usual efficiency. Mi Casa Restaurant ran the Cocktail Bar with its sophisticated delights. The Pisco Payat Bar introduced us to Peruvian Pisco, a first for most of us, whilst Bon Café’s Coffee Bar and Miss Chocolate added the final touch to the evening’s menu with excellent coffee and tempting chocolates. Coca Cola generously supplied every bar for the evening. It was unanimously agreed that the various live entertainers, Bradley from Artspace on 7, Northgate Jazz Club, and Simple Tone were superb. Pretty Megumi Nishimori, aged 10, charmed everyone with her graceful dancing to music from the Lion King. For all of this, much thanks to all concerned, not least of all the MC’s Pim and John and ‘auctioneer’ Philip Dailey, for their assistance. The Rooftop Party was honoured by the presence of US Consul General Michael Morrow and his wife, the Japanese Consul General Mrs Junko, the Honorary Consul of Peru Mom Luang Preeyapun and Dr. Samai Srirthongtahaworn from Rajagarindra Hospital. What makes every Annual Rooftop Party such an outstanding event is the continued support of major sponsors like Amari Hotels, Chiang Mai Mail and Citylife Magazine, joined this year by Toyota, Dusit Hotels and California WOW. The response to requests for prizes was overwhelming, as international and local businesses excelled all expectations by donating a wide variety of items and vouchers for the Silent Auction, Live Auction, Raffles and other games. All contributions were most gratefully received, however large or small, in the certain knowledge that they could be used in order to raise money for the chosen charity of the year. The Silent Auction raised 200,000 baht; the Live Auction in excess of 50,000 baht. See the list of raffle winners below. This year a staggering 938,000 baht was raised for the chosen charity, the Foundation to Encourage the Potential of Disabled Persons. The Foundation is based at the Disabled Centre, Rajpakinai 133/1, Chiang Mai. If you would like more details of their excellent work with the disabled, please visit their website at www.infothai.com/disabled. Through the generosity of the sponsors, donors and general public, sufficient funds were raised to provide a vehicle for the Foundation to enable them to visit and assist Thai people in rural areas around Chiang Mai. Toyota Chiang Mai agreed to supply the specially modified truck at a discounted price so that this dream could become a reality. As a result of this great kindness the additional monies raised will be used to buy mobility aids, (known as “tricycles”), which will greatly improve the lives of the more mobile of the disabled persons who are helped by the Foundation. Post-party calls and e mails confirm what was said on the night. Brilliant party! Fantastic prizes! Amazing result! …and… When’s the next one? Many of the prizes we gratefully received were put into the auction and silent auction, or given as prizes in the various games held during the evening. People who were unable to attend, but who still wanted to support the fundraising, bought raffle tickets. Here is a list of the winners. Items Nos. 64 And 76 Were Withdrawn. Equality in Diversity NOW! is the rallying call of the 3rd ILGA-Asia Regional Conference for Lesbian, Gay, Bi-sexual, Transgender, Intersex and Queer (LGBTIQ) people on January 26. For the first time in Thai history more than 250 LGBTIQ people from all over Asia proudly marched and danced in the streets of Chang Mai to make themselves visible, with the hope that the rest of the world was watching. 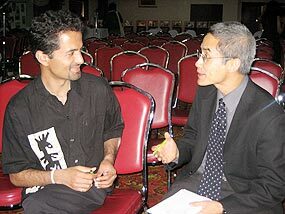 Professor Vitit Muntarbhorn (right) is chatting with Sunil Pant, President of Nepal’s Blue Diamond Society, about the Yogyjakarta Principles. 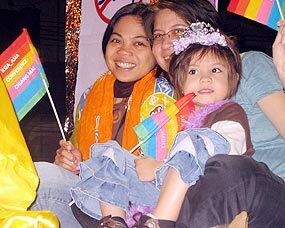 This pride parade and street party happened at Night Bazaar Street, starting from Buddhist Centre (Puttastan) to Pantip Plaza. This event also marks the ‘global day of action and mobilisation’ where millions of people, civil society organisations, and social movements from various parts of the world have organised events to show that ‘another world is possible’. “For ILGA-Asia a world that is truly democratic, is a world that is inclusive of all genders, a community that is accepting of gender diversity, religions that are respectful of sexual differences among people, and governments that protect and uphold the human rights of Lesbians, Gays, Bi-sexuals, Transgenders, Intersex and Queers.” said Mira Ofreneo, ILGA-Asia female representative from the Philippines. The conference was officially launched on January 24 with opening remarks from no less than Dr. Naiyana Supapueng, representing the National Human Rights Commission in Thailand, and Prof. Vitit Muntarbhorn, UN Special Rapporteur for the Democratic People’s Republic of Korea. the streets around the Night Bazaar. ILGA supporters are all smiles as the parade marches by. 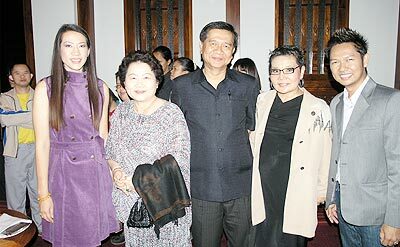 Anchalee Kalmapijit, Ampaipun Tubtong, Boomlert Buranupakorn, Earth Caiswang and Pakin Ployphicha (l/r) attending the Skål dinner at the Sofitel Riverside Resort. The Skål Club of Northern Thailand - a group of Hospitality Business professionals - met this month at the Sofitel Riverside for their monthly dinner gathering. The general manager of the hotel, Brendan Daly, opened the evening by welcoming the guests and introducing the Sofitel Riverside as an exciting new addition to the luxury hotels of Chiang Mai. An introduction with a video presentation by Mr. Nakayama of the Healing Family Foundation followed. To everyone’s surprise Mr. Nakayama brought along a group of disabled children from the foundation who charmed the audience with their coordinated dance steps. Following the delightful display, Anchalee Kalmapijit, president of the Skål Club, and Ken Hill, its director, invited everybody to stand, raise their glasses, and repeat the traditional Skål toast, after which everyone present enjoyed a delicious and elegant meal. It was a most cordial and enchanting evening. The Skål Club Northern chapter’s next monthly dinner will be held at the Teavana Hotel, Chiang Mai on February 28. Those who would like to join the club are asked to kindly contact Mr. Armin by email on: [email protected]. 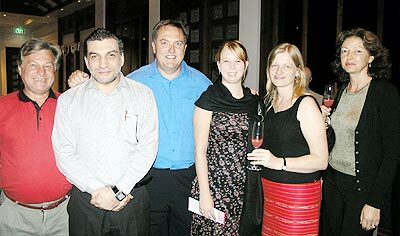 Mohamad, Bruce, Jessica, Annette and Anne (l/r).